SEMA Hall of Fame - Art Chrisman, 2011, Chrisman's Auto Rod Specialist (CARS). Pinpointing a single reason as to why Art Chrisman is being inducted into the SEMA Hall of Fame is difficult. For many, it’s unlikely that a reason is even needed. Chrisman played such a key role in the hot rod movement that his contributions are well known by most enthusiasts. His story is so significant that it’s resulted in The Chrisman Legacy: Always Faster, a 224-page book that chronicles the lives of the Chrismans and their undisputable contribution to the world of motorsports. 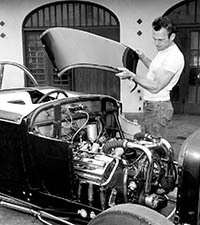 Working at his father’s Southern California auto shop in the 1950s, Art knew or raced against many of the big-name legends: Ed Iskenderian, Vic Edelbrock, Wally Parks, Pete Petersen, Mickey Thompson, CJ Hart, Lou Baney and many others. Among Chrisman’s many accomplishments is that he was the first drag racer to exceed 140 and 180 mph. He was also the first to make a pass in NHRA’s first national event in 1955. As of 2011, the legacy continued. Art and his son Mike were still working side-by-side at their shop, C.A.R.S (Chrisman Auto Rod Shop), allowing Chrisman to serve as a mentor and an inspiration to today’s, and tomorrow’s, hot rodder.